This post isn't to reopen old wounds or making anyone feel bad, but this blog is about my life, and therefore today it features some pain and truth and healing and so much more. Hemming and hawing, I looked at Father's Day cards this week with many emotions. This is the second year I haven't had to purchase one for Papa. Father's Day 2008 we announced our first pregnancy to him in a great-grandpa card. He showed it to all of his friends at his Saturday morning breakfast crew and at church as well. He was so proud. I can't help thinking about Father's Day without thinking about our first baby - the one we lost just a few weeks later. The miscarriage that devastated me, yet I believe started the process for healing in our family. I remember being at the hospital with both of my parents because I was in Illinois, and I was bleeding so much my mom had called my dad to come help take me to the hospital. I remember holding my dad's hand, feeling so unbelievably sad and scared and yet comforted at the same time. It was the first time I had felt close to my father in a very long time. Father's Day 2009 Bubby was in the NICU and Papa was in poor health. Bubby sent him a card, and Papa wanted it framed. And it is. With the picture of the two of them (taken later that year) next to it - Papa and his namesake. And last year we again told people of a pregnancy on Father's Day - which is our sweet Bugaboo. Only Papa wasn't around to tell. 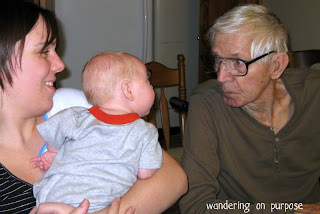 And this year Bugaboo is here with Papa's smile, and I miss my grandpa a lot on Father's Day. This day causes me such frustration because the cards are never right for me to send my dad. No card expresses how I feel because they are either generic or untrue for my situation. I don't say this out of anger - just honesty. We have had a lot of healing and reconciliation, yet time does not heal all wounds, at least not as quickly as we would hope. And what do you say in our situation of better-late-than-never-but-why-didn't-things-turn-out-better-earlier? I see the effort he is making, I am making, everyone is making to make things better for my boys, and my heart is filled with thankfulness, but sadness too. Because it never feels like quite enough, and today I realized it never will. "for all of the healing there are some needs which no earthly person can fill. some cracks which no clay will fix, ..." Emily W wrote this today. I cried when I read it because she expressed what I have been feeling for so long now. I cried in church today when someone shared about his father leaving their family when he was young and how he wrestled with why God let that happen. I saw someone else across the room shed some tears too, and I wondered if she was part of the club as well. For quite a while we all discussed Jesus not healing Lazarus in order for God to get the glory and for His followers to gain more faith and what that scenario looked like in our lives. Words here don't do the discussion justice. It was powerful to me. Lives spilling out from others' voices became a balm to wounds that were open today - not just with my normal Father's Day funk, but with the questions on the fairness of life in general with which I have been wrestling a lot lately. Later today I called the "like a dad to me" man from my teen years - I hadn't called him in so long - and I felt guilty I hadn't been "like a daughter to him" recently because my own life had consumed me. But we chatted and I got choked up as we hung up saying, "Love ya, man!" like we always do. I cry now thinking of how he has been such a positive person in my life all of these years. 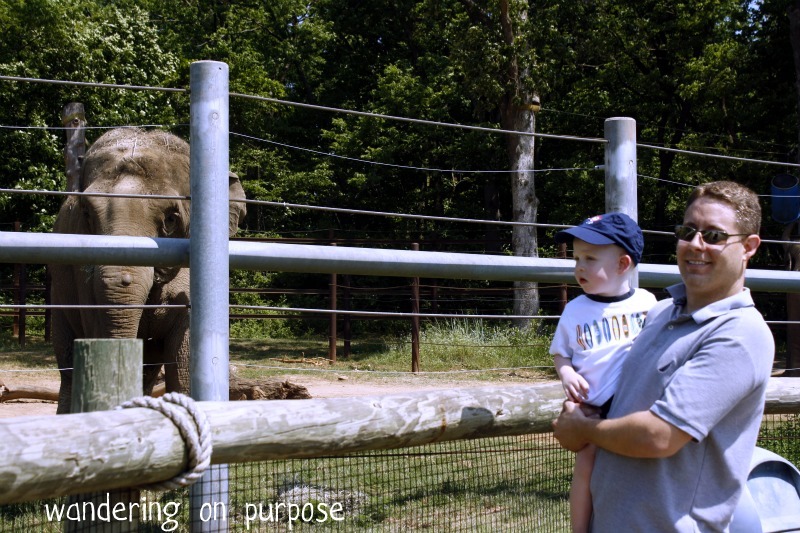 And yesterday I saw the man to whom I have said "forever" push a double stroller in the hot sun, hold a toddler up to see elephants and giraffes and feed an infant pureed peas while eating his own Father's Day dinner. Frustrate me as he might from time to time, the one thing I know almost more than anything is my husband will always be there for our children, and that brings me great comfort. Through all of these things - memories, words, conversations, lessons, scenes captured from behind a lense, Abba God gave me a Father's Day gift - the reminder that He sees my tears, my frustrations, my hopes, my hurts, my dreams, and He places people and Himself in my life to walk alongside me because He is good and He loves me. love that is lavished on me simply because I am His daughter - no works needed - just accepting the fact that I am His - how beautiful is that? I appreciate your candidness in your blog and loved seeing the picture of dad with you and Bubby. Papa would have loved playing with Bubby and Bugaboo and it makes me sad that they will never know how amazing Papa was and how much he would have loved them. I hope that somehow he can see how we're all doing and knows that your boys are SO special!